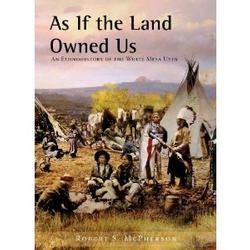 In" As If the Land Owned Us," Robert McPherson has gathered the wisdom of White Mesa elders as they imparted knowledge about their land--place names, uses, teachings, and historic events tied to specific sites--providing a fresh insight into the lives of these little-known people. While there have been few published studies about the Southern Utes, this ethnohistory is the first to mix cultural and historic events. The book illustrates the life and times of the White Mesa Utes as they faced multiple changes to their lifeways. It is time for their history to be told in their terms.